If you have ever looked at a tree and thought, “You know, I think that tall, leafy piece of nature is mocking me and I want to make it disappear in seconds!” boy do we have something for you to see! It carries the very mundane name “forestry mower” but it performs its work with a breathing speed and accuracy and we’re 100% certain it was designed by a BangShifter….long before BangShift existed. 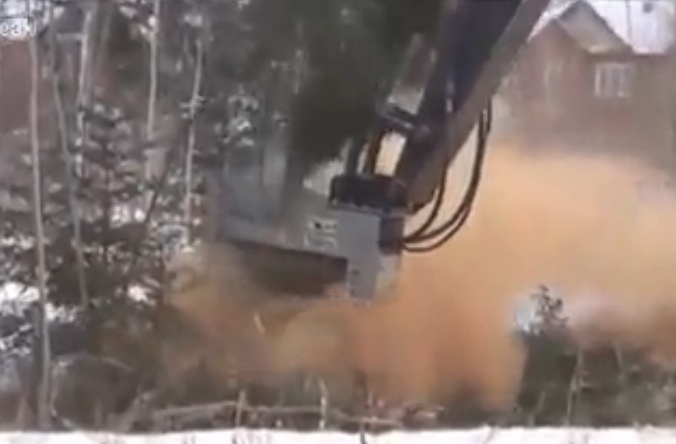 This attachment at the end of an excavator’s arm doesn’t knock trees over, it doesn’t pulverize them, it literally turns them into dust right before your very eyes in seconds. Oh, and by dust, we mean literal DUST. There cannot be anything left bigger than a human tooth when these things gets done, at least is sure seems like it to us. How do they work? Take a lot of pretty beefy steel teeth and spin them at an obscene speed then start at the top and force the whole rig down the length of the tree trunk and you move right onto the next one. In the video below, you will see mature, big trees get smoked in less than 10-seconds flat. Gone to the point that you you have never known they were there and the only trace they leave is the fragrant smell of fresh sawdust that fills the air. Chad’s on vacation so I start posting videos about flipping bridge construction and tree eating machines, but this stuff is pretty awesome, right? I love seeing this stuff because before today I never knew there was such a thing. I have since learned that there are smaller units that can be mounted on skid steer tractors, and small excavators for those “hard to reach” places, apparently. We bet the mythical Paul Bunyan would even tip his cap to this beastly creation because blue ox and all, he wouldn’t have stood a chance with this beast in the forest!